Peoria’s “We Make Families” is now a part of the award-winning Advanced Reproductive Center Network. We take pride in our results, but also our responsive & attentive office care team. We make it easy for you to contact us & secure an appointment. Our practice focuses on the needs of our patients, from developing a strong patient relationship, promoting a stress-free pregnancy, and delivering a successful birth. With an office in Rockford and our new Arlington Heights Location, Advance Reproductive Centers offer you a full range of infertility services including minimally invasive laparoscopic and hysteroscopic surgery, treatments to overcome tubal ligation and vasectomy, ovulation induction, artificial insemination, in vitro fertilization (IVF), and IVF with egg donation or surrogacy. We have an active micromanipulation program including intracytoplasmic sperm injection (ICSI) and embryo biopsy for preimplantation genetic diagnosis. Perhaps the greatest testimonies to our work are the many babies born as a result of our efforts. We are pleased with our very high success rates and proud of our commitment to provide high quality, state-of-the-art care to each of our patients, at the lowest possible price. No one will work harder to make your dream of childbirth reality. One of the Highest Success Rates in the Country! ARC is truly dedicated to making your dreams of a starting a family into reality. ARC generates excellent outcomes for our patients. Success rates with fertility treatment are extremely important. Quality and pregnancy rates can vary drastically from clinic to clinic. In order to receive the maximum benefit from IVF, protocols must be tailored to each individual patient. This is where the Advanced Reproductive Center excels. Done in Conjunction with IVF, Intracytoplasmic sperm injection (ICSI) is the process through which sperm is directly injected into eggs. Intrauterine insemination (IUI), sometimes called artificial insemination, is a treatment modality in which a sperm sample is placed directly inside the uterus. Our donor egg program has helped many women, who otherwise would have had no chance of experiencing pregnancy. I have personally experienced infertility. Having been through everything from Clomid to IVF, I have gained a perspective that is unique from most fertility doctors. I know what it feels like to be a fertility patient. I understand the emotions because I myself have felt them. While it was not an experience I nor anyone else willingly seeks out in the end I believe it has made me a better and more caring physician. The Advanced Reproductive Center is focused on achieving the 3Cs: Compassion, Cost and Conception. Compassion: We provide the highest quality medical care in a caring and compassionate atmosphere. Cost: We offer the highest quality care while keeping costs affordable by participating in most major insurances and offering package pricing and patient financing. Conception: We want you to conceive and helping patients meet their fertility goals is our passion. Experience has taught me that these three basic principles are paramount to ensuring excellent patient centered care. 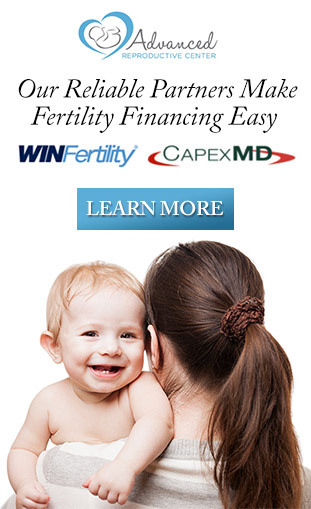 I look forward to helping guide you through your fertility journey. Please feel free to contact us with questions you may have.